On Saturday, June 30,the grandfather of all roller coasters greases up its tracks, shakes, rattles, and rolls in celebration of its 85th birthday. Coney Island’s pride and joy, the Cyclone rollercoaster opened its doors in 1927, was declared a NYC landmark in 1988 and has the title of being the most copied roller coaster ever built. The first 85 minutes of the event will offer 25 cent rides on the Cyclone in honor of its original price. Not only is the roller coaster celebrating its lengthy past, it comes with recent renovations, adding on 280 feet of brand new track making the coaster faster than ever before. Luna Park will offer a number of contests, giveaways and live performances for the special day. A combination of history and recreation, the Cyclone is a distinctive family-friendly attraction that of course, is just one stop within the Coney Island adventure. The Cyclone isn’t the only stop to make in Luna Park this Saturday, especially with the recent Coney Island Raceway and Boardwalk Flight additions in the Park’s Scream Zone. The Raceway comes with a chance to test your need for speed, with 900 feet of track and plenty of curves and twists to make it a true challenge. The Boardwalk Flight is for the fearless. A skydiving imitation experience that places you 200 feet above the ground and racing through the air at 60 mph. Other awesome attractions for the whole family include the Balloon Expedition, where you can catch the Coney Island skyline; the spinning Tea Cups; and more. Park prices and full ride descriptions can be found at www.lunaparknyc.com. After the fun and games of Luna Park, take a trip down to the legendary Coney Island Boardwalk where beach and ocean create an escape from the fast-paced city and amusement park life. The Boardwalk extends nearly three miles, and holds enough room for relaxation and sun bathing, as well as numerous sports courts, playgrounds and amusement rides. This can definitely be made into a full day family event, if time is cut short between the excitement of Luna Park and the Cyclone’s birthday celebration. 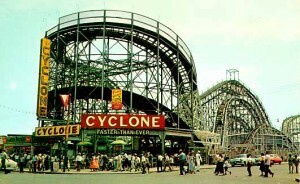 Another great Coney Island attraction hosts Brooklyn’s professional, minor league baseball team, the Cyclones. Located directly off of the Boardwalk, the park has been a landmark within the Brooklyn community and offers a variety of music and sporting events on top of baseball games. Summer nights at the ballpark are a perfect family event; view the game schedule for the Cyclones at www.brooklyncyclones.com. 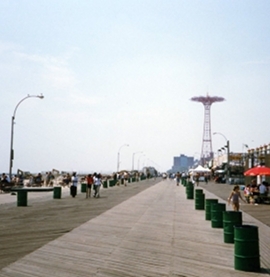 In order to experience the true flavor of the Boardwalk and Coney Island, Brighton Beach is known for its Russian cuisine and mouth-watering Eastern delicacies. Tatiana offers an eclectic menu from a widespread sushi and sashimi menu, to Ukrainian borscht and lamb entrees. Recommended dishes include the smoked fish platter, chicken cutlet Kiev and lamb chops. The ambiance reflects Russian elegance with a kick, as Friday, Saturday, and Sunday nights host a live band and Las Vegas theme. 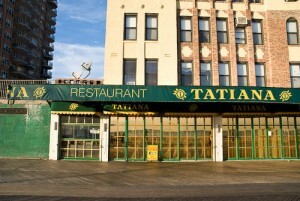 A full menu list can be found at: www.tatianarestaurant.com. This entry was posted on Thursday, June 28th, 2012 at 8:46 am	and is filed under Stuff to Do. You can follow any responses to this entry through the RSS 2.0 feed. You can leave a response, or trackback from your own site.